Mind Wanderer: What Do You Want More On This Blog? I really need your help. Please do VOTE for me. "What do you want more on this blog?" I need your suggestions for my blog, okay? Vote will be highly appreciated. Once you vote, you've supported me and also my blog! Thanks a bunch for you guys, who already voted for me!!! I hope in the future this lovely blog will able to afford your wants. And also... do comment on each my post! It has been available now. Simply click on the link beside the post title! This drama is an adaptation from a popular comic written by Sekiya Tetsuji. 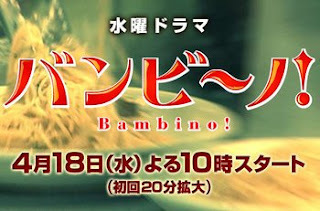 After a year of working at a neighborhood Italian restaurant, Ban Shogo (Matsumoto Jun), an enthusiastic and cocky young college student from Fukuoka, Hakatta, comes to Tokyo to improve his cooking skills as a chef in Italian cuisine. He discovers he has much learn and has to continually prove himself to a very competitive, quick and efficient staff at the upscale Italian restaurant. Anyway, I'm starting to love PASTA! Haha. Ban-chan cooked it well. Somehow I love Mukai Osamu! He's too cute for his age!!! Yosh~ I'm gonna go. Wanna continue Bambino. sip sip! eh, comment lagi dong di post gue yang lain! hey, I vote for MORE QUOTES. aku suka liat quote orang2 sih. thank you for supporting me and my blog with the comments! so far, I think this blog needs more quote and also interesting articles! wait for my new posts and keep commenting XD thanks a bunch!